Today, July 6th, is the feast of St. Maria Goretti! We have a bunch of friends coming over for some Saintly Summer Fun to honor this beautiful saint, who was a "Martyr for Purity." Lily Lollipops - St. Maria is often pictured with an armful of Lilies, which symbolize purity. You can purchase the mold here. 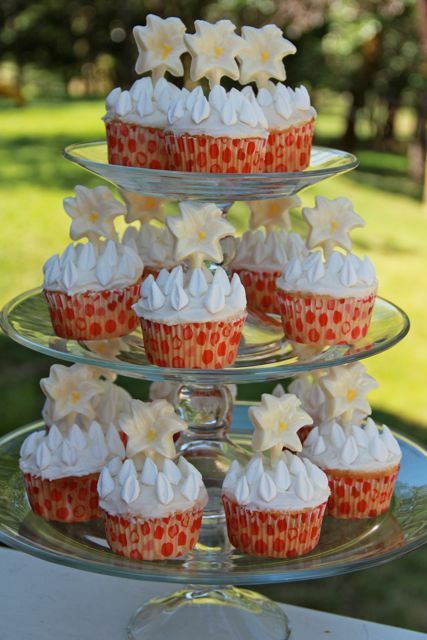 Mini Marshmallows - 7 for each cupcake, cut at a diagonal to create 14 flames. These represent the 14 lilies that St. Maria offered Alessandro in a vision, one for each of the 14 times she was stabbed in the heart, which then transformed into 14 still white flames. 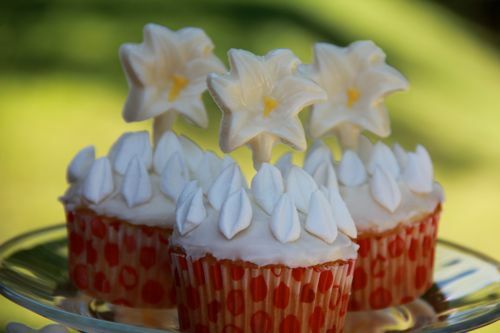 Red Cupcake Liners with White Cupcakes and Frosting - Symbolizing the fact that St. Maria was a Martyr (red) for Purity (white). St. Maria Goretti, Pray for us! What a great idea Jessica! These are SO beautiful, Jessica! I love the symbolism and the story behind it. Very moving. I'm from Brazil and I've been following your blog and I'm simply loving it. I also have a catholic blog, called "Mulher Católica" (Catholic Woman). In Brazil we are not used to cooking according to the saints' day, making special food to comemorate specific days. I should have written you before, because I usually translate some of your posts (two, to be more exact) and publicize them in my blog, including the photos. I'd like to know if you mind about that. I apologize for not asking you before doing that. I've included the link to your blog in order to reference your website as the author of the post. God bless you! The work you do in your blog is great! wow these are really beautiful. I always love your stuff!